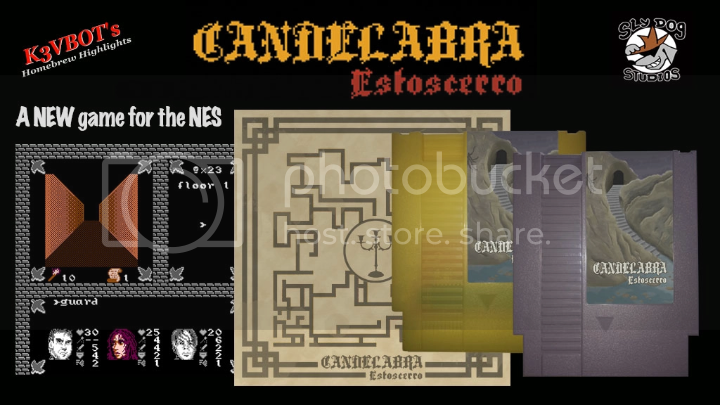 The First NES Homebrew Dungeon Crawler to hit the market. Programmed by Sly Dog Studios, and presented to you by K3VBOT's Homebrew Highlights Candelabra: Estoscerro is a 3-D style, action-adventure, dungeon crawler in which the heroes from the games "The Mad Wizard", "The Scarlet Matron", and "The Warlord Slayer" band together in a quest compelled by the king. Exploration within a maze environment while battling enemies and enemy bosses are the fundamentals of the game. Your journey will be complete upon reaching the plateau's top and finding the Candelabra. Kickstarter projects are best in threes! It's time again for a Kickstarter round up. Here are three projects that are live and fully funded. Take a look at these sure things and place an order before time runs out! Another 'new' old game by The Oliver Twins, there are still 5 days left for you to get in on this fully funded 8-bit adventure. Pledge for the rom or a boxed copy of the game and have them autograph it all for extremely affordable prices ($10-$60). We personally hope that the closet they keep finding these unreleased games in is just a little deeper! Pat the NES Punk has tackled the Super Nintendo in a monstrous tome of 450 pages. With 11 days left, you can pick up a copy for $60. It covers the nearly 800 games officially released in North America and PAL territories, along with a section on unreleased titles. Taking bets on what's next: N64 or Gameboy? Where Pat went big, Jeffrey Whittenhagen has gone small and shrunk his SNES book down to travel size! With just a little over 1 day left to pledge for this project, you can pick up a digital or hard copy for under $30. If you're into homebrew releases, you can also purchase one of three SNES games along with your book: Sydney Hunter, Little Medusa, or Socks the Cat!